Several years ago, Devin Montgomery decided that, while he loved the concept of volcano-style kettles like the Kelly Kettle, he didn’t love their weight and bulk. Rather than sit back and wait for somebody to develop a volcano kettle that fit his needs, he decided to just go about making it himself. In the meantime, he documented his progress, starting with recycled aluminum bottles held together with JB Weld, and working his way up through the process of purchasing and learning to operate a metal lathe, and finally to contracting professional shops to develop the product. 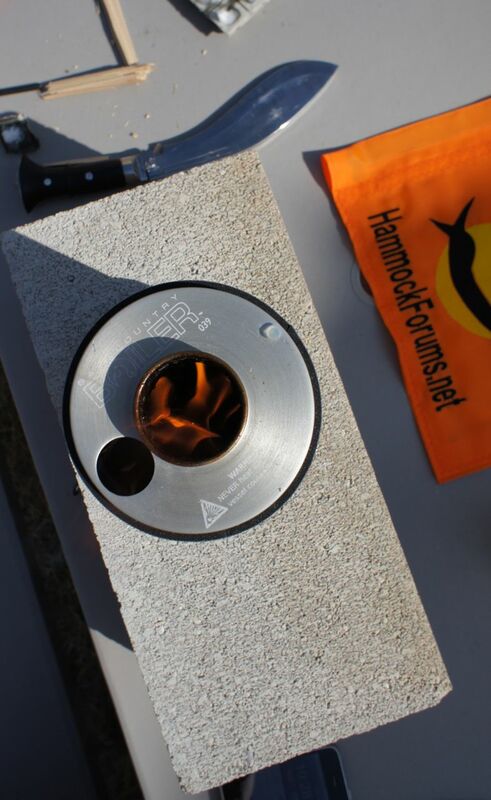 I feel quite fortunate that I had the opportunity to follow his progress, documented from start to finish on the Backpacking Light forums, and that I got to be one of the first purchasers of this exciting, ultralight chimney kettle. 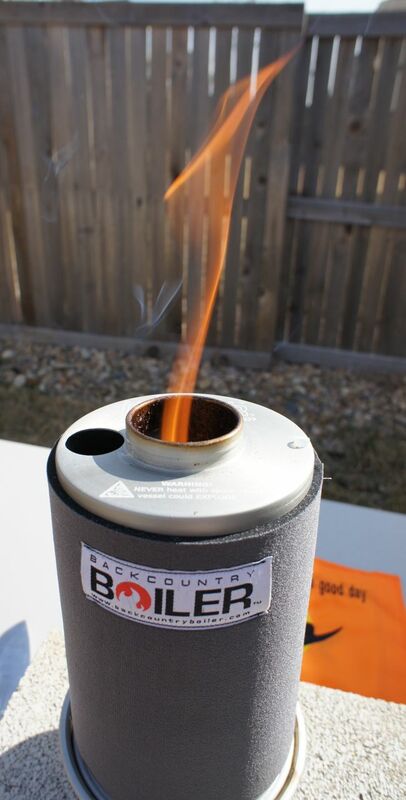 What follows is my humble review of Backcountry Boiler # 039 by The Boilerwerks. For those of you who may not be familiar with the concept of a chimney kettle – it works like this: At the bottom, you have a sort of dish, with a hole in the side. 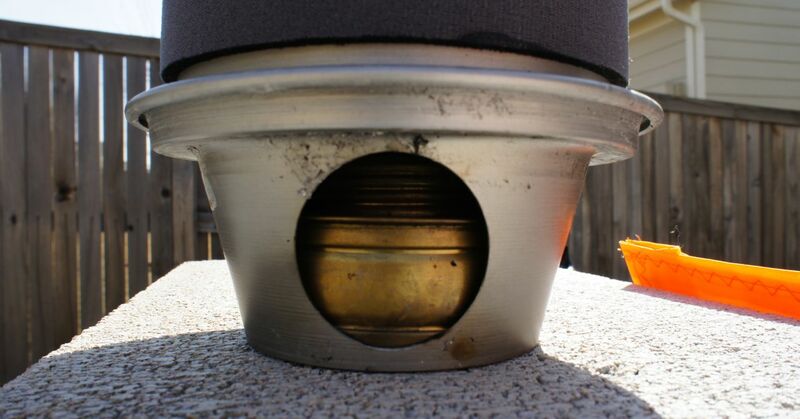 This dish is filled up with fuel, and acts as a firebox. 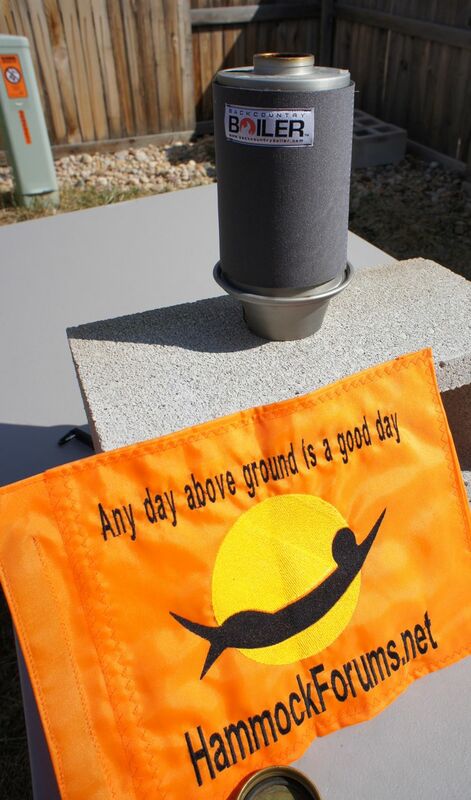 The hole gives you a place to feed in fuel, as well as a place for air to enter. On top of this dish, you place the kettle – but it’s no ordinary kettle. Instead, the kettle has a chimney up through the center, so that the flames and smoke can feed through this chimney, and the water will surround them on all sides. This leads to a very efficient transfer of heat fr om the fire to the water. 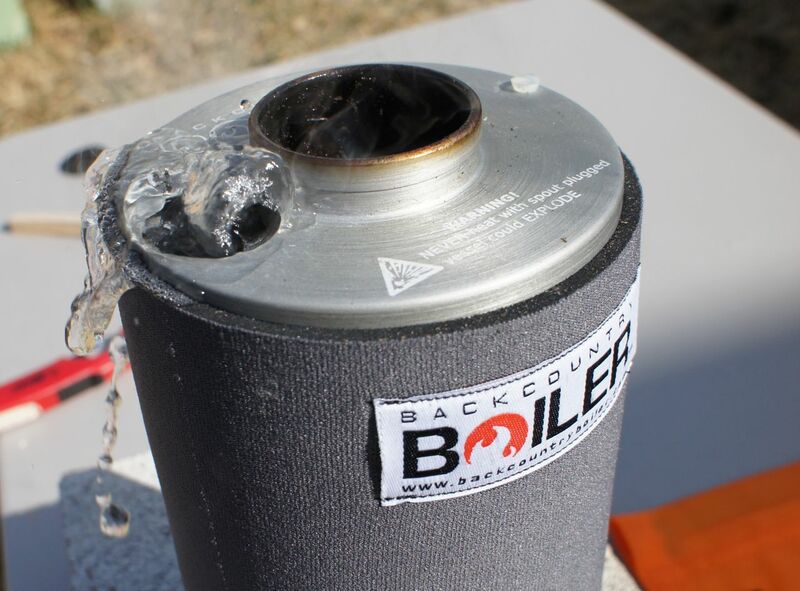 In terms of fit and finish, I was very impressed with the quality of the Backcountry Boiler. Devin thoughtfully had the attention to detail to anodize the aluminum, then have the boiler laser etched. Not only does that etching include a sweet logo but it has a serial number cementing your place in history. 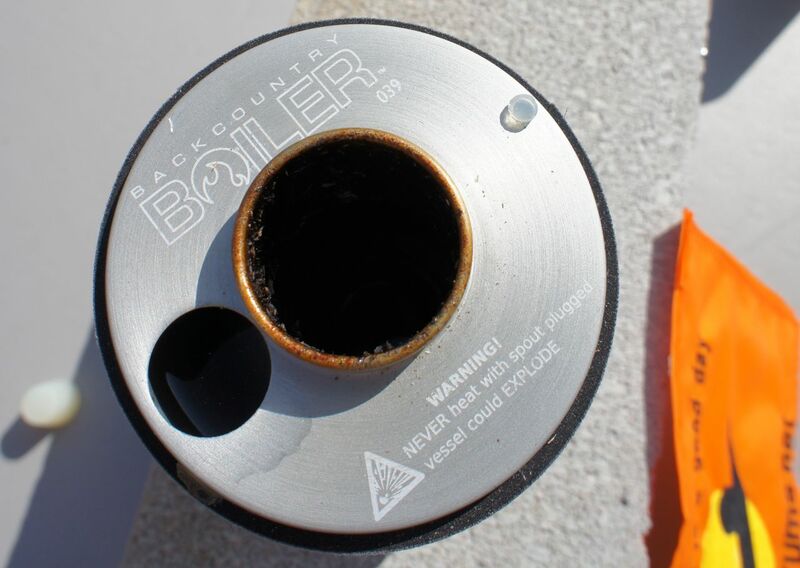 Depending on the package you choose, the boilers ship with a silicone stopper, which can be used to store and carry water inside of the boiler. Obviously, it would be a very bad idea to keep the kettle sealed while boiling water inside of it, with the risk of explosion due to pressure buildup. Devin has included a helpful warning right on the top of the Boiler, warning you to be careful to avoid this potentially dangerous mistake. In addition, the Supreme package which I ordered came with a nice stuff sack, and a swanky neoprene sleeve. This sleeve lets you lift the boiler without touching hot metal, and since the flames are confined to the chimney on the interior of the boiler, there is no worry that the neoprene will overheat. It’s a very nice touch and makes using the boiler so much easier. For this review, I’ve chosen to test two different fuels. 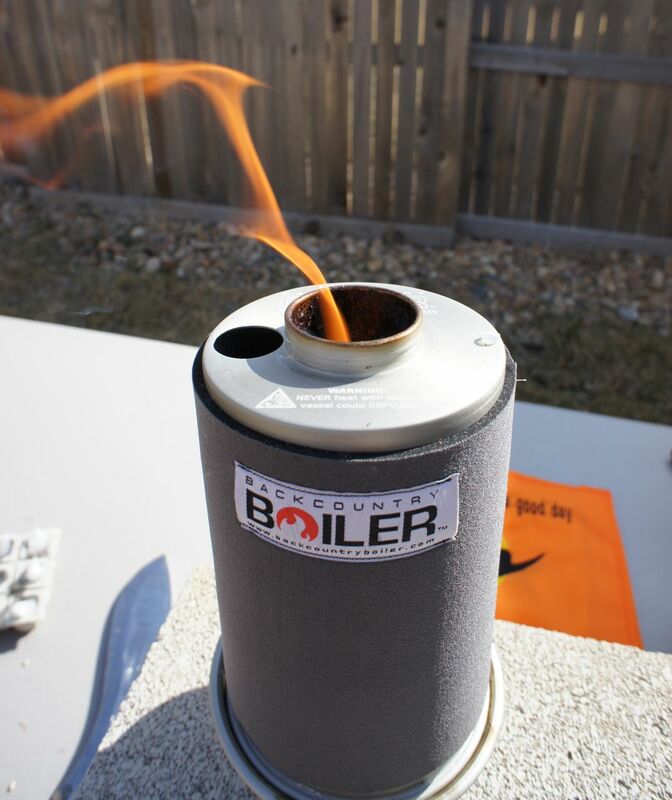 While the Backcountry Boiler was designed to be a wood-burning stove, for convenience, it is often nice to be able to use simpler fuels, which don’t require gathering, such as ebsit tabs. In this case, I will be reviewing the boiler used wit h an alcohol burner made by Trangia. This small, brass burner is very convenient, because it has a screw-on lid, which can store un-used fuel inside of the burner. It runs on many types of alcohol, but I usually use it with denatured alcohol, which can be purchased in the paint section of your hardware store, and is an inexpensive source of fuel. The one concern I had when using the Trangia burner was that it completely fills the fire cup on the Boiler. I was worried that this might obstruct the flow of air into the boiler, and while it does affect the burn somewhat, it is not a serious issue, and the Trangia worked very well in the Boiler. How well, you ask? I filled the boiler with two cups of cold water (around 40F), and timed the burn. From the moment the Trangia was lit, the boiler attained a rolling boil in 6 minutes, 35 seconds, using less than a half ounce of fuel. 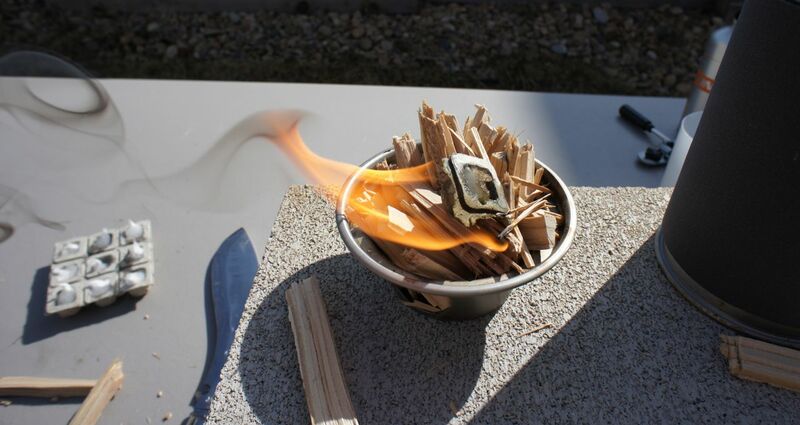 Satisfied that alcohol burning would work quite well in the boiler, I moved on to its primary purpose – burning wood. Here, I’d like to take a little aside to mention Devin’s packaging method. 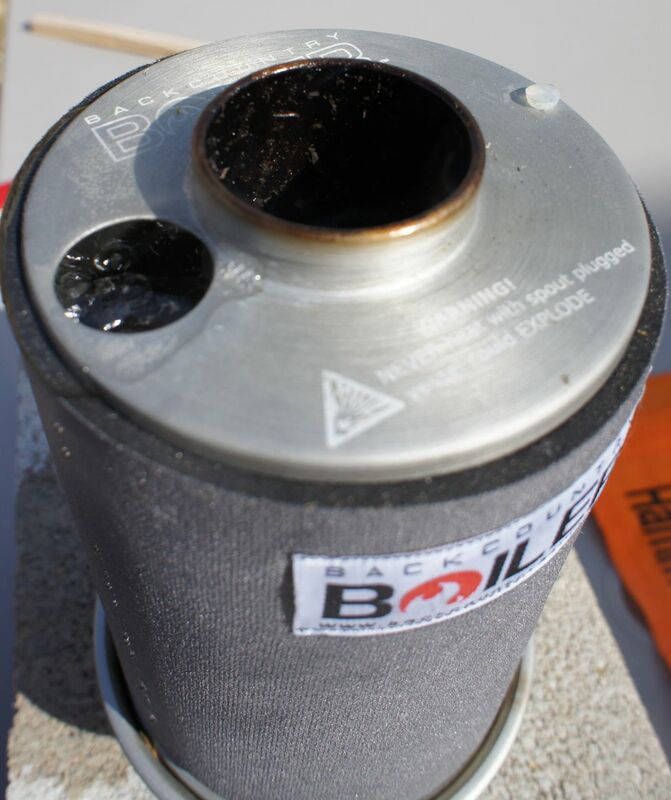 Everything he used to package the Boiler is flammable – that means the package can actually be used as fuel for your first few boils. One neat trick is that, for the spacer material in the box, he used the pulp-based cells shown at the top of the picture to the left. 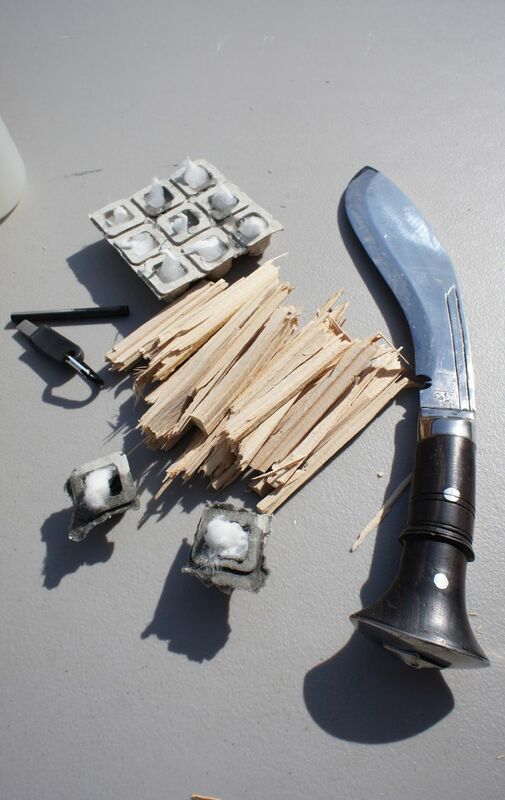 If you take these cells and place a bit of a cotton ball inside of them, then fill them with melted parafin wax, they make absolutely awesome little fire starters. For the fuel for the review, I used my Himalayan Imports Bonecutter kukri to split some pieces off of a 2×4. I live in a suburban neighborhood, with few trees, so burning little sticks wasn’t exactly an option for this review. I broke the split pieces up into short chunks, and was ready to start my fire. One of the concerns I’ve heard voiced about the Boiler was that people were worried that they would have to keep feeding fuel, or blowing into the air hole, to maintain the fire. In an effort to test this, I decided to heavily batch load the firebox, and use it in a “Top Lit” configuration. I piled up the pieces of wood, with smaller bits on top, placed the firestarter on top of the pile, and lit it up. Once it was lit, I placed the boiler on top, and started my stopwatch. From above, you can see the flames starting to lick up the chimney inside of the kettle, and you can see the pour spout leading in to the water chamber. The wood burned quite vigorously, and it was quite a bit more fun than the alcohol burner – there’s just something inherently fun about playing with fire! The flames shooting out of the boilers were quite an impressive sight, showing up plain as day even in blazing afternoon sunlight. Since I wasn’t adding any fuel, the fire burned down somewhat on its own, becoming a mix of hot coals and flames, and smoking quite a bit. It was still very hot and kept burning without adding any fuel. Eight minutes, eleven seconds after lighting the firestarter, there was a rolling boil. Obviously, this doesn’t include the prep time of splitting up and breaking the wood, but still, a sub-ten minute boil, using a handful of fuel, without touching the stove once during the boil, is pretty dang impressive. 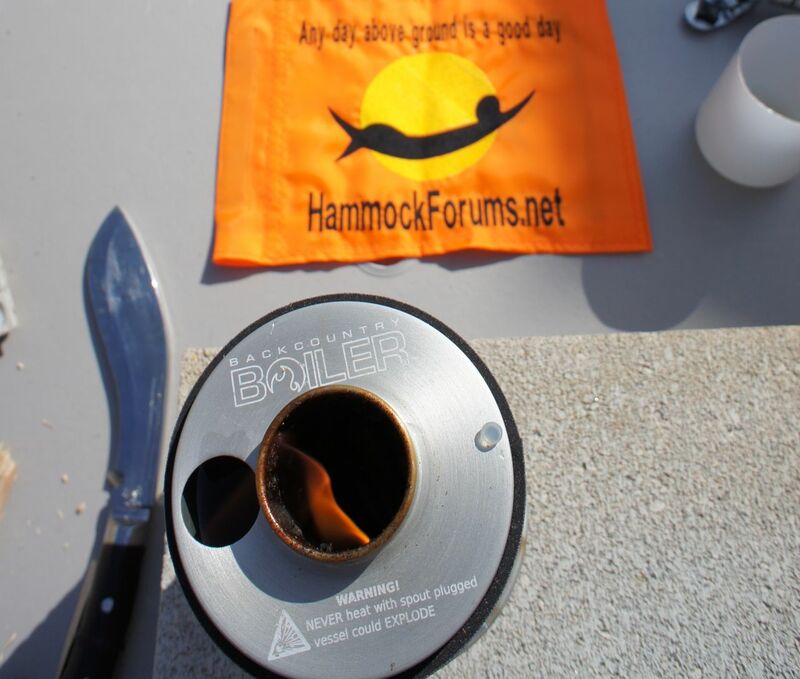 That rolling boil actually brings up one of the few issues I have with the Backcountry Boiler design – since the capacity is so close to the two cups you will typically want to use for most dehydrated backpacking meals, the Boiler will tend to boil over when it first hits a rolling boil. Not a huge issue by any means, but I could see someone being careless and getting hit with some scalding water. A small extended spout might help somewhat with this issue, and I will probably be experimenting with a DIY insert-able spout for exactly this purpose. Once the water was a-boilin’, and my coffee was ready, I let the fuel keep burning. That one small load of wood was enough to provide an eight-minute boil time, and kept burning for another three minutes afterward, easily enough time to boil even the coldest of water. 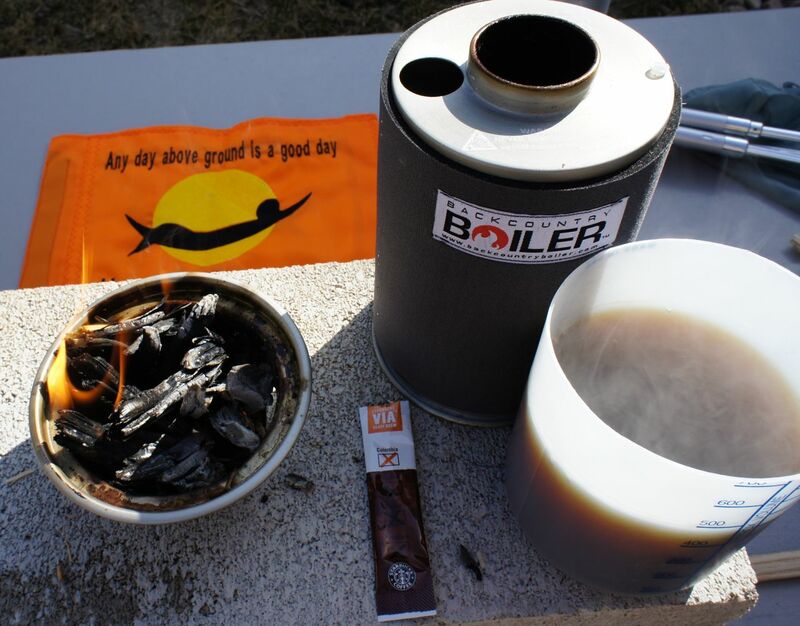 It’s safe to say that the Backcountry Boiler can easily boil two cups of water with minimal fuss, and do it on a handful of twigs gathered from around your campsite. Final thoughts? 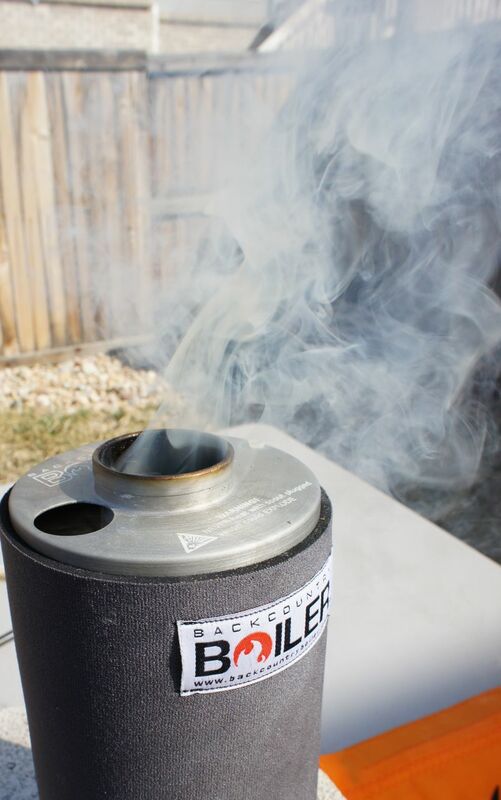 For a simple, no-hassle, and fairly quick way to boil water in the backcountry, Devin’s Backcountry Boiler is hard to beat. 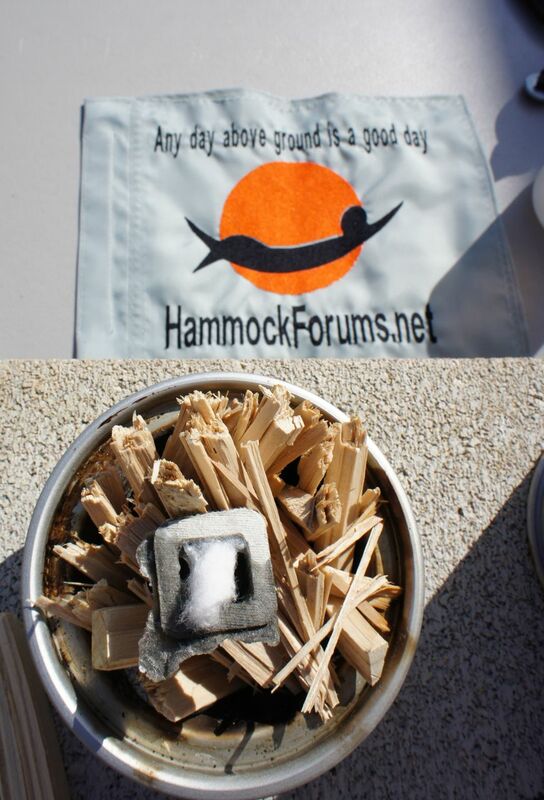 It works on multiple sources of heat, and can boil water on a batch-loaded set of found fuel with minimal hassle and in less than ten minutes. 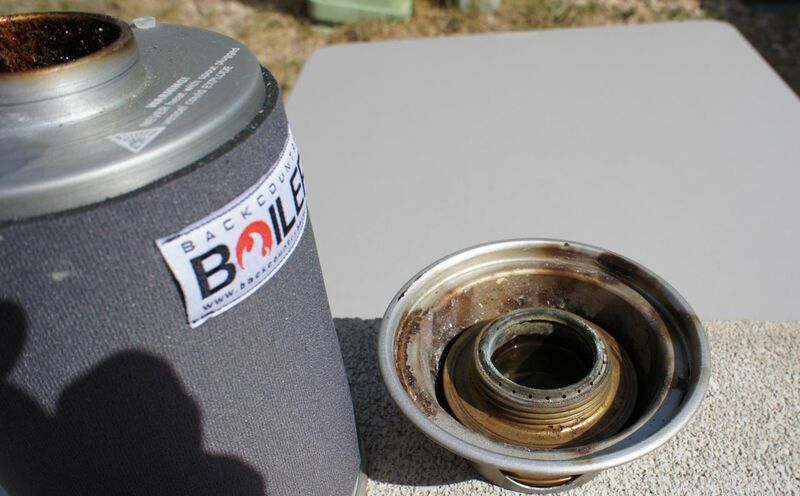 For those instances where I don’t expect to be cooking anything, and will be relying solely on dehydrated food, the Backcountry Boiler is likely to become my go-to backpacking stove. With the small exception of the pour spout, which is prone to boiling over and potentially close enough to the chimney to get ash into your water, the Backcountry Boiler is one of the best-designed backpacking products I’ve purchased in quite a while, and I plan to use it on many outings. Great review! And the demo of the untended top down fire was taken to heart-nice to know one can be performing other camp tasks while the water comes up to temp. Superb and thorough review, thanks. As you know I’ve been playing with my Backcountry Boiler with ‘alternative’ fuels and I can’t wait for my first wood burn. I’d love to see a summary of your results outside of the Twitter character limit. There seems to be a huge variation in the performance of different alky stove designs – I think the Boiler is actually so good at creating a draft, that it makes many alky stoves burn way too fast and hot to efficiently transfer heat to the water in the boiler. Some of the best ones so far seem to be those that partially block the air inlet. Pingback: People (and dogs) seem to like it! I’ve tried mine in the field so to speak both with the Trangia burner and with wood collected on site. The Trangia was used on an exposed hilltop in a light breeze and boiled 500ml in around 8 mins from lighting. On the second boil I was in the forest which was sheltered and I used twigs, bark etc that was lying around, the boil time was around 6.30 mins. In both cases the water had been in my pack, on the hill top it had actually been carried in the Backcountry Boiler. To avoid boil over on the 2nd attempt I lifted the boiler just as it was about to spill over so no problem. On the hill was my 1st ever attempt at using the Backcountry Boiler although not my 1st experience with woodstoves. It seems like boil times are all over the map on the Trangia – I’m guessing that it’s very sensitive to wind. It gets quite windy here in Colorado, so that might explain my short boil time. Unfortunately the production run hasn’t started yet, but Devin can notify you when he does start them. It might be worth emailing him to find out exactly when it will be available. sure James Ive done just that via his site, I’ll sit back and wait the reply. Thanks for your reply. I’ve never noticed any sort of residue on my boiler. You might want to try soaking it with a mixture of a good kitchen degreaser and water. Alternatively, you could contact Devin through his website at http://www.theboilerwerks.com and see what he recommends. Me too. I have had nothing but problems with mine, first a tiny leak at the bottom, which kept getting the fire wet. I needed to scrape some oily wax from inside the water chamber out. It has been nothing but problems for me. The Backcountry boiler is not ready for prime time. I feel cheated having wasted so much time on this. Have you tried to contact Devin? He is now shipping from stock and has a new version of the boiler – he might be able to help you out. This is a cottage industry and there are bound to be bumps along the way. You might have waited a long time, but to say you “wasted so much time” is a bit over-dramatic don’t you think? If you’re unhappy with the product, contact the seller and see if he can help you out before you say you were “cheated” on a random product review blog.